One of the things I don’t like are bell peppers. They’re one of those things that people are, for some reason, always trying to convince me to like. (What’s up with that?) And they always seem to put them on airline food as well, presumably due to their forceful, overpowering flavor, which helps the food make more of an impression on our dulled palates at higher altitudes. (And in my experience, my brain, too.) And if there wasn’t a ban on bringing pointy metallic objects on planes, I’d travel with a set of tweezers to remove the offending red and green strips they seem to like to drape over everything. However, like just about every other thing in my life, there’s a contradiction. And in this case, it’s that I love chile peppers — in all shapes, sizes, and colors. Go figure. I crave just about anything home-grown, which may be because I live in a city with lots of cars, dogs, etc, where anything growing, you’d be wary of eating. And when we take a ride out to the country, we invariably try to hit as many markets as we can, whatever town or hamlet (which is a goofy word, isn’t it?) that we’re visiting. I love nothing more than being confronted with baskets of berries from farms, mountains of winter squash piled on tables at greenmarkets, and bundles of fresh herbs that look like they were gathered by an actual person, rather than the plastic-encased bundles in the supermarket. When we were in the southwest of France this summer, my friends were growing piments d’Espelette in their garden, where I went out before each meal and picked what we’d have for dinner. Most of the time in France, you only come across piment d’Espelette ground to a powder, where it enlivens everything from scrambled eggs to Basque cuisine, the same region where the peppers are predominantly grown and dried. 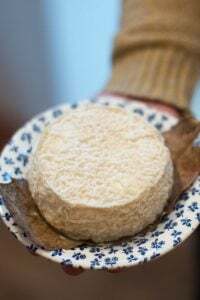 But I’ve not come across them fresh at any markets in Paris, and as we all know, when you can’t have something, that’s when you really, really want it. And I’ve been having a hankering for them ever since last summer. 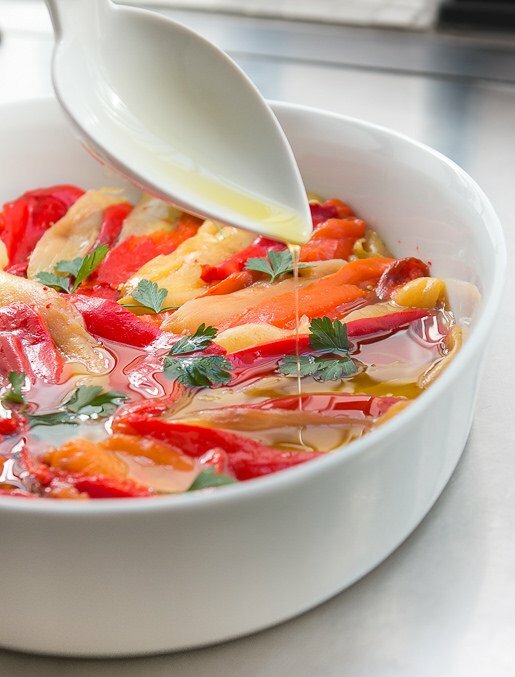 Even fresh, the peppers have a faint smoky flavor and are enticingly spicy, enough to overwhelm the Parisian palate, but satisfying the Basque — and the occasional American — one. (When he is fortunate enough to get his hands on them.) As my friends packed up their house for the winter, they harvested what they could and brought it up to Paris, surprising me with two dirty, but delicious beets, a basket of the last fresh tomatoes of the season, a bag of tiny onions (which I made marmalade from), and a huge sack of mixed chile peppers, which I put in a bowl and admired, until I realized it was use ’em or lose ’em. So I got out my grill pan and roasted them all off. Once cooked and peeled, I let them marinate in quite a bit of olive oil, with salt and pepper, and we enjoyed them with a nice dinner of steak-frites with a decent bottle of red, toasting the last vestiges of summer. 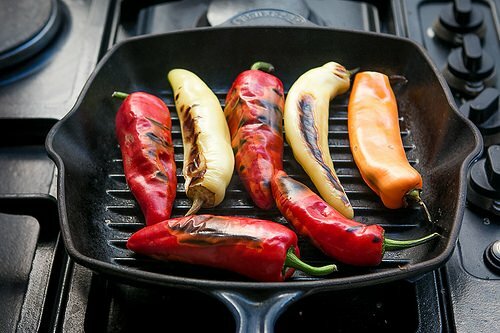 Of course, if you have an outdoor grill, you can use that to grill the peppers. Once peeled, some people rinse the peppers to get all the seeds off, but others feel that washing them removes some of the flavor. Personally, I keep a bowl of cool water while I’m peeling the peppers and dip the peppers in quickly, to get rid of the seeds.Chile peppers have thinner flesh than bell peppers, so you may not get those generous, picture-perfect slices of roasted bell peppers like you would with large bell peppers – although this technique works the same with bell peppers, if you’d like to roast those. But it’s not important; it’s the flavor that’s so special.Chiles really vary in terms of thickness, density, and so forth; some will be easier to peel, and others might ne trying for those of you (or I) with OCD. But once they’re all roasted and peeled, by the time you’re drizzling them with olive oil, you’ll be congratulating yourself on a job well done. 3. Once the chiles are cool enough to handle, either completely cut them all the way through in half, vertically, or slit them open so they lie flat. With a paring knife, scrape away the seeds, then turn the chiles over and pull away the skin. 4. Quickly dip the roasted chiles in a bowl of water or run them under the faucet, if you wish, to remove any stray seeds and pat them dry. 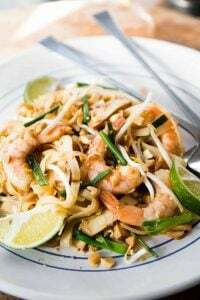 Lay them in a serving dish and drizzle them with a generous amount of olive oil, and sprinkle them with salt and pepper, finishing with a scattering of chopped or picked parsley leaves. Storage: The chiles can be roasted up to a week in advance, marinated in the olive oil with salt and pepper, and stored in the refrigerator. (They can also be frozen, see links, below.) Serve at room temperature. The colors in the photos alone was enough to bring me joy! Beautiful! It looks like you have some of what we call “banana” peppers in there along with red jalapenos. And, in that third photo is that a red squash blossom I see in the upper left? 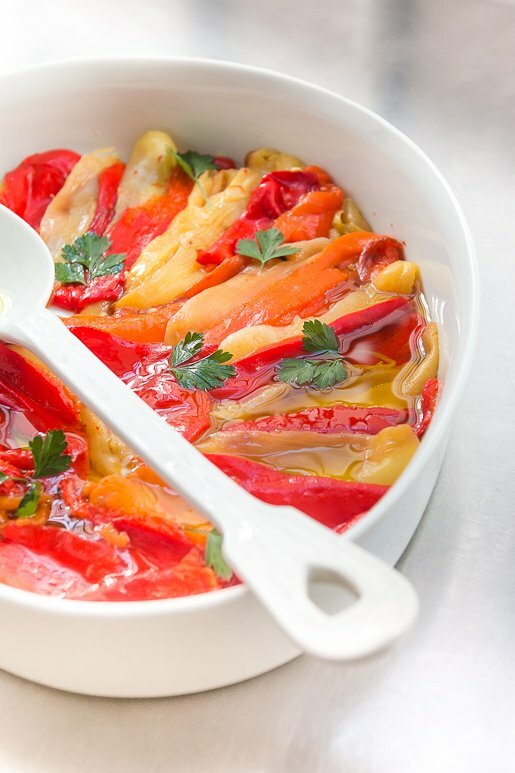 After marinating and prior to eating, did you refrigerate the peppers? 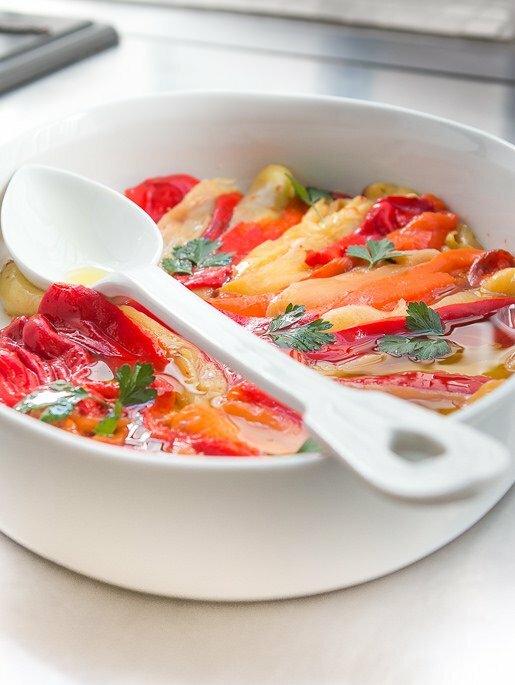 Peppers are an integral part of the Middle Eastern diet, and a salad of roasted peppers of all kinds, draped in olive oil and garlic, is de rigueur practically in ever meal or buffet. It really warms up my heart to see this dish! And I completely know what you mean about fresh bell peppers, though I do love them roasted. Because the peppers are the primary ingredients, I can’t think of a substitution for them. But you can certainly grill many vegetables, such as zucchini and eggplant, and give them the same treatment. I happen to love them in pasta with sausage. You’re not alone, David! Many people, our family among them, either dislike or have problems with bell/sweet peppers, but love chili peppers. There is no reason not to use chili peppers in place of bell; the variety of color is there for people who want to add color to a dish, and there are plenty of chili peppers with little or no heat, for those with timid taste buds. (Restaurants would do well to take notice also.) Always enjoy your blogs. Even easier than using a paper bag or bowl and plate is to simply use a saucepan with a lid. Easier to lift the lid on and off since it has a handle, and it won’t break if you drop it. But kudos for suggesting using a plate rather than plastic wrap. The excessive and unnecessary use of plastic wrap in American recipes is a pet peeve of mine. Annabelle from Tercera Farms in Bolinas grows piment d’Espelette and sells at the Berkeley Farmers Market. I buy them every year, but this year bought extras, tied them together and they are hanging in my kitchen from a doorway. Some call it a summertime version of mistletoe, I call it an edible decoration. I’ve never eaten them fresh like other red peppers, will give it a try. They are really good on a roll with hot chorizo and rocket/arugula/ruccola. My current craze at the moment. Food and travel go so well together! I’d recommend visiting the village of Espelette in the Basque region of southern France. The entire village revolves around the locally produced peppers and it’s quite charming. There’s also a local cherry festival the beginning of June that’s a lot of fun, too. People get quite serious about protecting the origin and therefore the name of the peppers. The name is protected under the EU PDO (Protected Designation of Origin) program so properly, only peppers grown in the area immediately around Espelette can be called Espelette peppers, much the same way cava is cava and not champagne. There’s a vendor at the San Francisco Ferry Building Farmers’ Market that sells wonderful, hard-to-find peppers. She has dried ñoras and chiuacles among others. We’ve had an incredibly good pepper season in Umbria…so good, I had to stop making and eating peppers at every meal. This was by request, not my idea. Something I’ve found helpful, is to roast the peppers on a bed of coarse salt. It helps to absorb the excess moisture and makes the peppers easier to peel. How timely–last Friday I roasted some chiles over the gas burner, and wasn’t THAT a finicky project! And the week before, we were contemplating whether it was worth keeping that ridged cast iron pan that seemed like such a good idea. We never use it to grill meats, as I always deglaze the pan for sauce. Now I know! Have you ever been in Northern New Mexico when the chile roasters are out? It’s an unforgettable experience – the smell of roasting green chiles is one of the very best smells that I can think of! KK — I have! After living in the Santa Fe area for 10 years, I will always associate the months of September and October with the smell of roasting chiles. Every supermarket has a large revolving roasting drum, heated by gas jets, that can roast a whole gunny sack of chiles at a time. 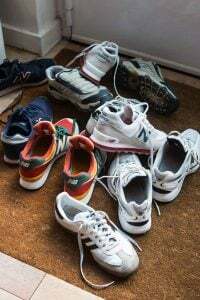 The entire parking lot and environs are permeated with an aroma that makes you want to rush off and find the nearest restaurant offering a plate of green chile enchiladas. Oh, to be in Santa Fe, now that Fall is here! I recall, like it was yesterday, however it was in 1996, upon visiting Rome, many of the restaurants had displays of peppers seen immediately upon entering their establishments. There were long platters of roasted and marinated red and yellow banana peppers and roasted garlic cloves dotting the platters. The colors were made more vibrant by the olive oil coating the flesh of the peppers. 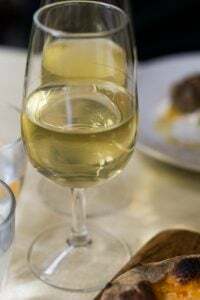 Of course, we would order a platter to our table and with some nice bread, more oil and some wine we would start the evening feast with this feast of color and flavor…….thank God for the blessed gift of memory. How spicy does that end up being? I assume its not blow your head off spicy without the seeds – would be appropriate to serve as a side dish for people who regularly eat Mexican food / reside in Southern California / have an undying love of sriracha but maybe not for kids? Great post! 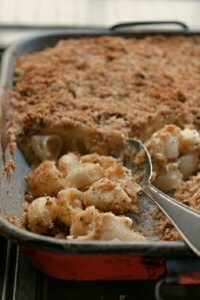 One of my favorite things to eat and least favorite things to prepare, but always worth it in the end. Funnily enough I saw some piment d’Espelette exactly like these in the market today in my town in Provence and wondered what to do with them…..now I know, hopefully they’ll be there next week! Grew up on them (a Sicilian staple) and still make them…whether roasted in the oven or on the bbq, they are wonderful. Fantastic with roasted onions and Italian sausage on a roll. Love your pictures! I’m with you on peppers, bell and chile. 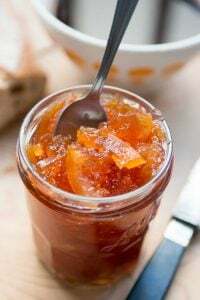 Any suggestions for tomato jam recipes? Yes, I have a great recipe in my book, Ready for Dessert, along with rosemary cookies, which goes well with it. Love red, yellow and orange bell peppers. But green ones are only good for composting. Ick. 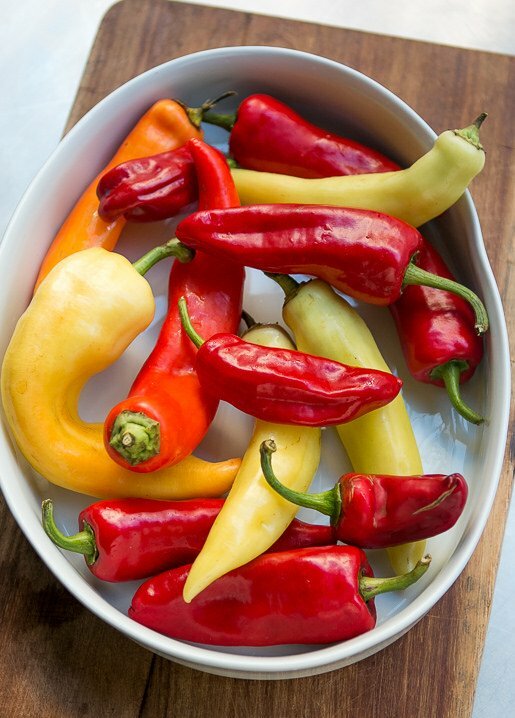 Red, yellow and orange sweet peppers are ripe fruits where as green peppers are unripened. Eating green peppers is akin to eating green apples, not so good for the stomach in many many people. We live in Southern New Mexico where it is the chile capital of the world. 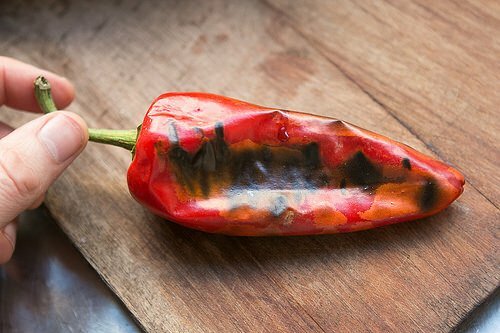 I loved your roasted chile article! But, you ain’t seen nothin yet about roasted peppers. David, Labor Day Weekend is the Hatch Chile Festival. It is a not to miss affair. Talk about roasting chile, we in Southern New Mexico really know how to do it, outdoors in a cage over an open fire. I hope you can put us on your travel Schedule next fall 2015 in time for chili harvest late August thru early September and Labor Day in Hatch. 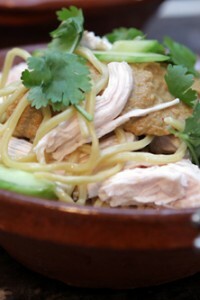 We welcome foodies on your website to come too! And that’s why it’s frustrating growing bell peppers in your home garden. It takes forever for the greenies to ripen. And if you don’t pick them regularly, it keeps new ones from setting. 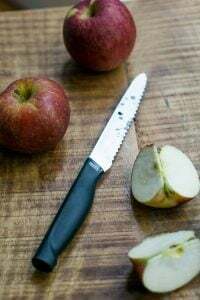 It’s easier to peel them if once roasted you put them in a bowl, sprinkle them with plenty of salt and cover them with a lid until they get cold. 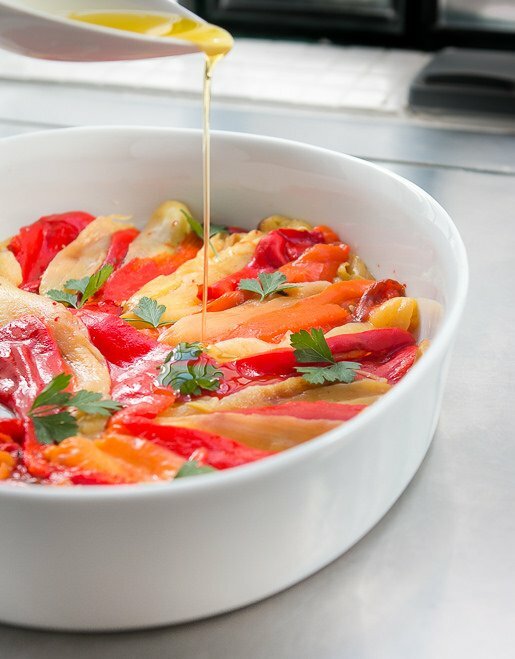 I love roasted peppers and the colours in the photos are so vibrant and beautiful! Also, a side note, WHO likes green peppers. seriously. Hey David, what olive oil do you use? Just moved to Paris and obviously I can’t get my local Australian stuff. Steve: I actually use olive oil I got in Sicily. When I was there last year, I lugged back 10 liters. (It’s from an organic farm there and is only €9 a liter!) There are some good olive oil stores in Paris. One that I like a lot is Sur les Quais. I love to spend hours in the kitchen but for some reason have little patience when it comes to peeling the skins off blistered peppers/chillies yet they always taste so good. I have to have one big session and can them until I need them. The colours on these are just beautiful. Just this last weekend I made roasted red pepper mayonnaise. Dealing with leftovers – a cup of egg mayonnaise with just one roasted (rested, peeled) red pepper blended into the mayo. Great with fresh prawns (shrimp) for a sunny holiday Monday lunch. I broil peppers – mostly long sweet red peppers – in my big toaster oven, cut in half, cleaned, cut side down, about 15 minutes to get the skins near totally blistered black. Zero attention paid: the oven shuts itself off! 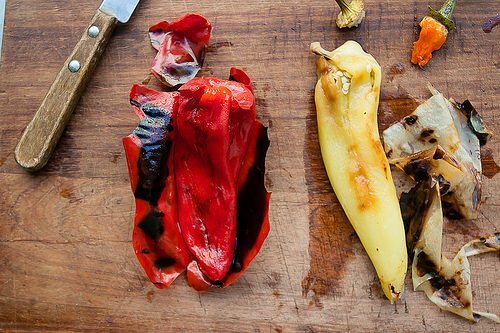 If the charred peppers are immediately put into a bowl or pot with a tightly fitting cover, this “steams” them and in about 10 minutes the skins will come off more easily from the un-charred edges. The peppers freeze perfectly in their own juices. I used to make a salad similar to this with anchovies-heaven! I find capsicums (bell peppers) incredibly mild, so I’m bemused by the idea of a forceful, overpowering flavour – if only! :) I certainly won’t be trying to persuade you to like them, however – the world is stuffed with plenty of other yummy things, after all. 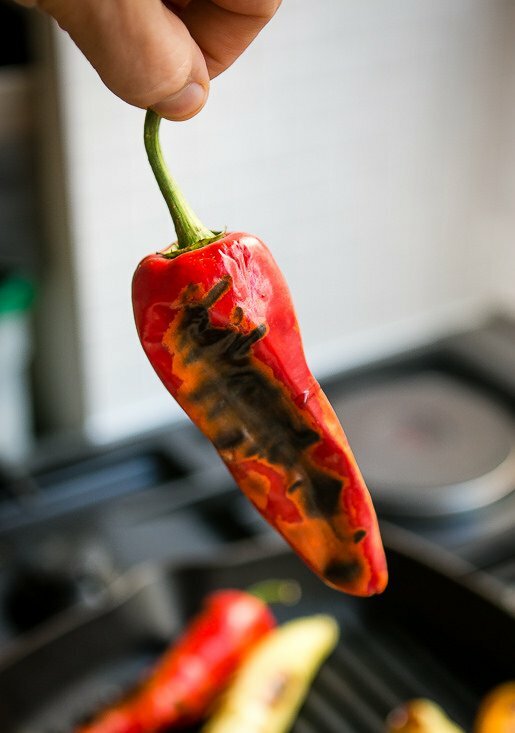 Although I buy very few pre-prepared items, roasting peppers is something I’ve outsourced, as it’s rather tedious to do and where I live it costs little more to buy them ready-prepared. If people do want to give it a go, another way of doing it which is quicker than using a grill is to hold them (in tongs!) in a gas flame until they blacken and blister. Those are some gorgeous peppers! I wasn’t a fan of peppers for most of my life, but suddenly about 10 years ago I started liking them! Not sure what that is about, but I like all types now. Thanks for the shout-out for my roasted red peppers! This is the complete opposite of me… I put bell peppers in EV.E.RY.Thing. :) Thai food, Italian, Mexican, Spanish, even French inspired… oh man. With a little paprika and a cream sauce? Yum. Yum. :) Just saw this because I was pulling up your vanilla ice cream recipe– I make a double batch of it every month or so. Today is the day! Your pictures are fabulous! Tell me, do you have a big window in your kitchen, or are you carting your plates all over the house looking for adequate light like I am? Je suis jaloux ! Thanks! I have large windows but not a huge amount of direct light 90% of the time. I mostly shoot pictures right next to the stove, on the stainless-steel countertop, which is kind of my “sweet spot” since it’s so convenient. And the light can be nice, depending on what time of the day it is, or the season. I don’t particularly like bell peppers either. Something nasty and waxy about them. Even in terms of mild, sweet peppers, I prefer the long ones: Hungarian, Portuguese etc. They have much more flavour. I adore piments d’Espelette. They are not very hot, but they have the most exquisite flavour. I’ve bought some lovely ones here, but the Espelette consortium would say that those grown “away” are not true piments d’Espelette. I’m going to make a little sauce for some venison empanadas I’m making, with those that remain. I like heat, but I’m not really what one would call a chilli head. Do not especially like burning my mouth. But I’ve spent extended stays in the Netherlands where a red bell pepper grown in a hothouse is practically “spicy”. Fortunately there are Indonesian and Turkish peppers nearby. Just a quick thank you for your beautifully written and illustrated blog. I am so excited to see it pop up in my mail. We can grow these peppers like crazy here in Dallas and I have never thought to use them like this. So pretty and inviting. Thanks! Cranberry Raisin Pie Recipe – after reading your comments about it recently, I looked for the recipe, of course. Help! 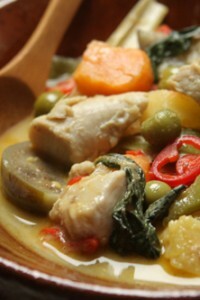 Your link to the recipe gets me a “Merde!” page. Can you please post it again or fix the link or… It sounds delicious and necessary! Thank you for your speedy response. The thing is, I have checked both of those FF cookbooks, and there is a Raisin Pie, a Cranberry Pie, and an Apple-Cranberry-Raisin Pie. But I’m not clever enough to combine any of them into what you made sound like something I must make – and taste. Flour and sugar, of course. Lemon juice, orange juice, lemon rind, a little butter?? I don’t have my copy of the book, but leafing through the index to The Fannie Farmer Cookbook (which is online, on the Amazon page) it says the recipes is on page 649. 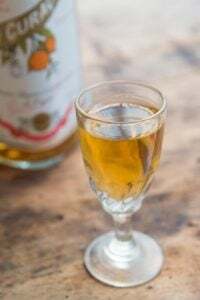 It was a perfect combination of the two ingredients, along with some zest and a good dose of Grand Marnier. Happy baking! Tracking down the version of FF with that recipe… thanks for pointing me in the right direction. But have you tried the yellow/orange/red bell peppers? They’re much milder and sweeter tasting than the green ones! ^ That’s the argument that always crops up if I mention I don’t care for bell peppers. And I have tried – I really have. They’re bright and colorful and healthy…and yet they taste terrible ;) That said, I do cook with them for my bell pepper-loving daughter and husband and just pick them out of my own dish. I have never tried them but here during Ramadan peppers are super hot item, what we do is; we get them fried dipping in little salty flour and then fry it in boiling oil for less than a minute. The flour creates a good crust around the pepper and it is nice. Tip: Make a slit in the peppers and take the seeds out before roasting. Much easier and not slippery. Using permanent, washable items is so much preferable to me (an American). For one thing, paper bags aren’t meant to be in direct contact with food or heat. Think of the glue! I read your post the day before I went to Sacramento. When I returned, I stopped at the Pedrick Produce Market near Davis and brought a bag of “sweet” peppers. Following your description, I roasted the peppers, scraped them free of seeds with my paring knife, then sliced them into strips. I placed them into a Tupperware container, poured in the oil, and voila! They taste great, with that sweet but chile bite. I roasted mine on an roasting grill, which gives flame direct access to the peppers. Mine were quite a bit more charred than yours, and the peppers were not quite as bright and colorful as yours. I guess that is a product of the extent of charring, but the skins come off very easily. Great post. You’re the second person I’ve noticed using that grill pan, which makes me want to ask: why do you use that pan and not an open flame/burner? When I char my chilies I use a tiny (really crappy cheap old) cooling rack on top of a gas flame, then proceed just as you’ve done. As long as I remove my smoke detector first, it works fabulously. Wait, is it because you have an electric stove?